A question I get asked often: How about intravenous ascorbic acid? I have NEVER tried IV C, so I do not know if this would help me. Try it if you want, and tell me. I am curious to know. I do not need to try IV C, because my intramuscular shots are highly effective. I do not want to try IV C and here is why. Too much aluminum exposure. With my IM shots, my aluminum level per lab work stays in a normal range. A bag of any IV fluid whether C or saline or anything would contain that much more aluminum than a small shot. Aluminum is everywhere in the environment and cannot be utilized by the human body. At high levels, aluminum is toxic. Aluminum is not absorbed well in the human digestive track. But injecting substances with aluminum, your body absorbs it, too. In physiology class, the doctor said IV nutrition is not well absorbed. Not sure if that is true for C, but by injecting C into a fatty area (buttocks), the body has the opportunity to absorb it and use it. I have a genetic disorder, so my body is constantly making this genetic error. Regular dosing of C to help my body cope with this error is logical. In fact, at first I only received C shots once every two weeks. I felt better from this but we did not know the C was the helpful ingredient. Groping in the dark, trying to help me improve, we increased the frequency over the years, to once per week, every three days, every other day and finally everyday. Everyday shots got me out of bed, healing, strong and functioning. Looks like my body needs help every single day. In fact, if I am sick or injured and when I was in opiate withdrawal, I do two shots per day. This makes a difference. My dosing is based on protocol for treating burn victims who, like me, need to repair tissue. Healing takes time. Read the drug facts for ascorbic acid with your doctor and decide. Collagen takes 6 to 8 weeks to repair. The human body is constantly rebuilding collagen. In the Age of Sail, when the disease scurvy (deficiency of vitamin C) killed thousands of sailors as they were at sea for months on end, with no foods containing vitamin C, their old wounds would come apart and bleed, and broken bones would unknit at the break. Guess we humans need a constant supply of vitamin C or we will fall apart. Interestingly, scurvy also caused cognitive problems. A person with scurvy could not think clearly. Does EDS make you seem like an idiot? Me too, before the C.
My shots travel easily. The C is best refrigerated and protected from light, but it will survive at warmer temperatures with little loss of potency. I have no trouble getting my supplies through airports around the world, in my carry on bag. Here my injectable C is going through security at the airport in Brussels. This bag has a thermometer, but any insulated bag will do. 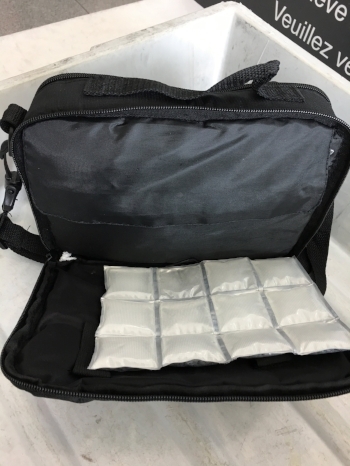 My diabetic supply travel case has a separate compartment for the ice pack. Bring two ice packs. I ask the front desk at a hotel to store one in their freezer while I use the other to keep the C cold. Another ice pack inside. The C is in the polka dot bag, where it has extra protection from light. Mr. Pennington drawing me shots in the English countryside at the home of our friend. He is very helpful. Close up shot of pulling the C into the syringe. After six weeks in Europe, I had filled a Trader Joe’s sauerkraut container with my sharps. I will be dumping these at the medical waste bin at the doctor.